As the all-consuming joy of the holidays disappears and the realities of the food we have consumed over the past month sink in, the number of New Years Resolutions to lose weight pops up like a cholesterol meter. 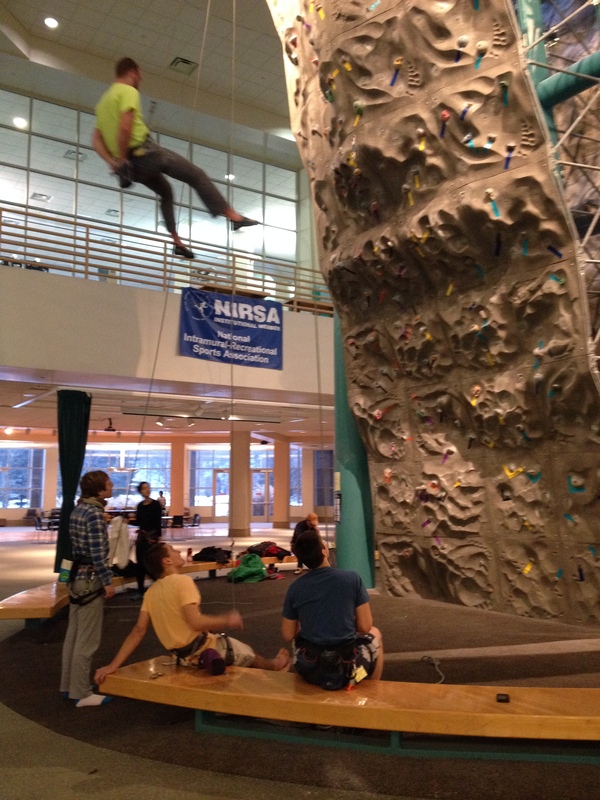 New Years Resolution-motivated or not, students have been frequently utilizing the Ping Student Recreation Center this semester. Photo from Ohio University. As the second semester begins, Ohio University students seem to be more motivated than ever to trek through the snow to Ping and hop on a treadmill. Whether it is for health reasons or to impress a New-Years-kiss-turned-possible-romance, attendance at Ping has skyrocketed in this past month; according to Larissa Keiser, Assistant Director for Promotion, Communication & Assessment of Ping, Ohio University’s recreation center attracted 19,773 patrons in the first week back from Winter Break alone. Don’t start clapping just yet: this attendance is more necessary than believed. A study by the US National Library of Medicine National Institutes of Health found that weight gain during the 6-week holiday season explained 51% of total annual weight gain. Furthermore, according to a report in The New England Journal of Medicine, most people don’t ever lose the weight they put on during the holidays. And for people who are already overweight (i.e. half of America), the news is even worse; the average holiday weight gain for those already fighting the bulge is five pounds or more. That’s almost one pound per week. 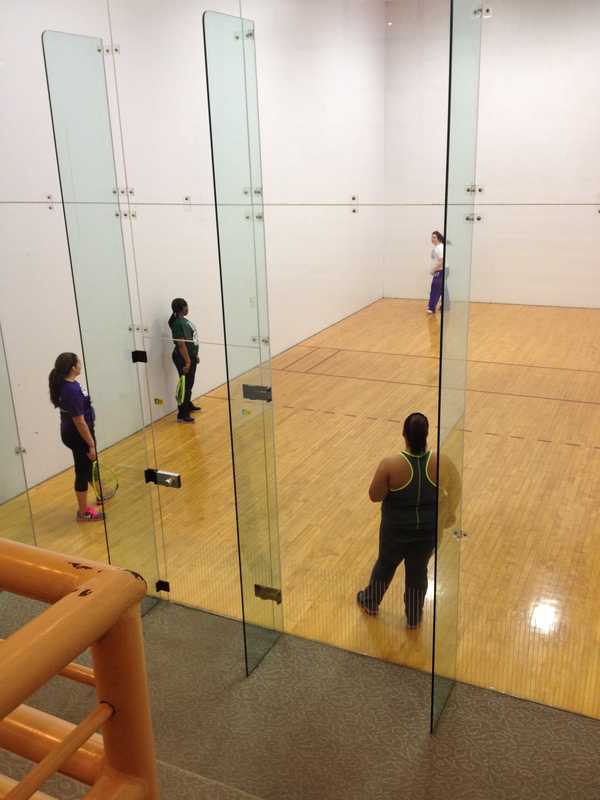 Even the Racquetball courts are full. Photo by Bianca Hillier. battle. With January attendance rates on the rise at Ping, Caporaso has had trouble simply finding a machine to use once she arrived. Tasha Westfall, Intermin Assistant Director of Ping, says the center is doing everything it can to decrease these situations. “We handle the increased numbers now by having more staff members on duty and also making sure that things are cleaned, in working order, and ready for student use,” she says. Westfall adds, however, that since “space is something that we can’t immediately change,” there is little she can do besides inform attendees of the most strategic times to workout. “Ping is busiest between 4-8 p.m.. It is not as busy first thing in the morning and later at night before we close… we encourage patrons to come in during those “non-peak” hours,” she said. 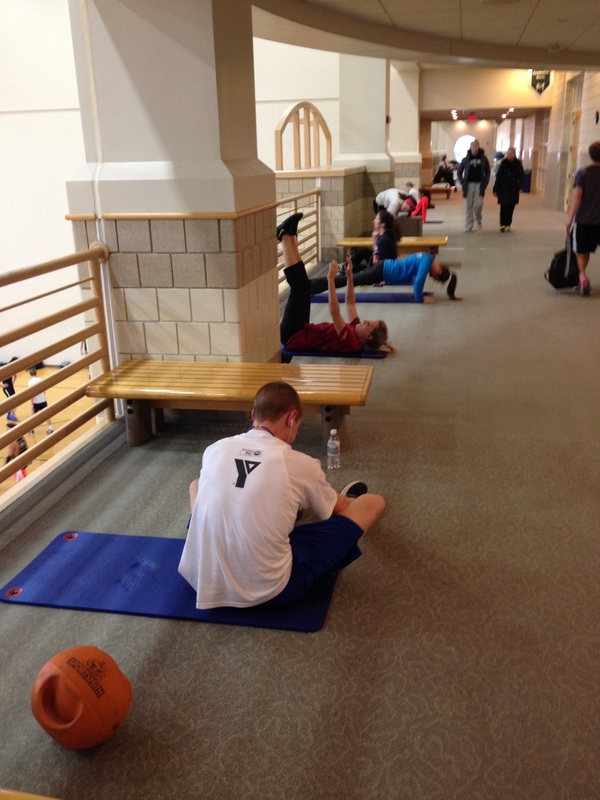 Students line the balcony in Ping to work out. Photo by Bianca Hillier. Kesier provided the numbers to back up this claim: on January 13, 72% of the people who attended Ping arrived between 4 p.m. and 8 p.m. That number steadily decreased to around 35% within a week, however, a total of 40% of the attendees that week came within those peak hours. Contrarily, only 12% of attendees arrived at Ping between 6 a.m. and 9 a.m. or 9 p.m. to midnight. Caporaso attests with these peak hours, but says they’ve been irrelevant so far this semester. “This past week there was a ton of people, even late at night after 8 p.m., so it seemed like people were just headed to the gym once they got out of classes and were done with their day. The traffic never stopped,” she said. “As soon as the weather warrants people running, etc. 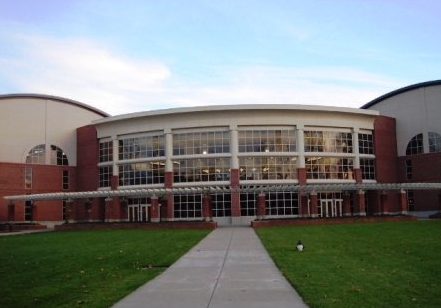 outside, I expects participation rates to decrease slightly,” Westfall said. Read: we live in Ohio, where the winter temperatures tend to stay throughout February and creep into March, as well. So bundle up, Bobcats, and get ready to fight for a treadmill, because Ping is packed.